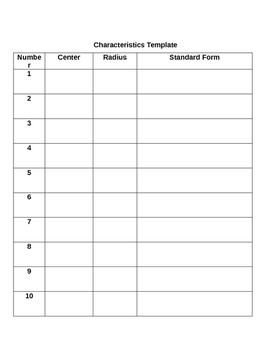 In this project/task, students will be demonstrating their knowledge of graphing circles, identifying centers and radii, and writing equations of circles in standard form. 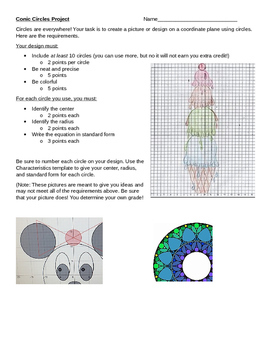 Students must create a picture or design which includes at least 10 circles on a coordinate plane. Their design must be neat and colorful. For each circle, students must identify the center, radius, and write the equation in standard form. There are points assigned to each requirement for a rubric. This can be adjusted to include other conic sections as well.